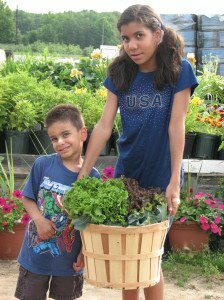 Jersey Fresh produce, locally grown right on our South Brunswick farm! 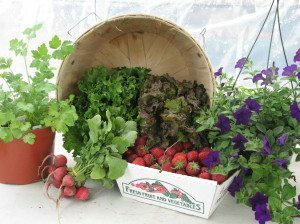 Our CSA produce is picked the day you get it – any fresher, and it would still be growing!! Get the details & sign up NOW! 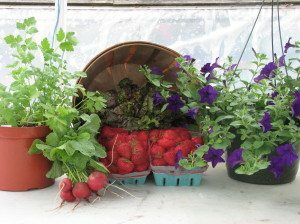 For your convenience, you can pick up your weekly share at the farm or at one of our convenient Host Site locations. There is no rhyme or reason as to what you’ll get in your Weekly Veggie Basket. 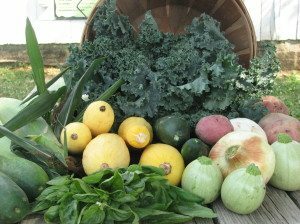 What’s in season and abundant at the farm each week is what you will receive. Weather plays a big role in what crops are available, and when they are ready to harvest. A drought can kill crops, but so can excessive rains. Cool nights, or warm ones affect the readiness & ripening of most crops. 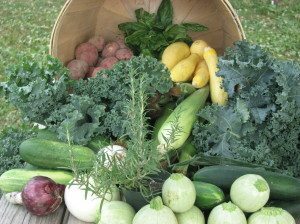 View all the details about our Weekly Veggie Basket Program. Although our Weekly Veggie Baskets usually include some fruit, it’s not much. We don’t grow much fruit, as most fruit crops are perennial & must have land committed to them for years at a time. 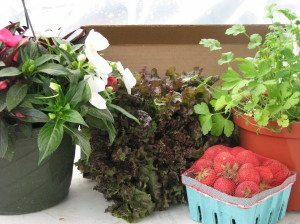 To please our fruit loving CSA members, we now offer a Fruit Share that includes 6 weeks of seasonal local (not all homegrown) produce. Our personal shares are equivalent to a quarter share. 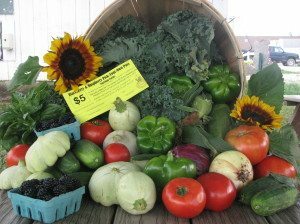 Personal shares will most typically contain 4-5 types of vegetables each week, and is designed for individuals or 2-person families. 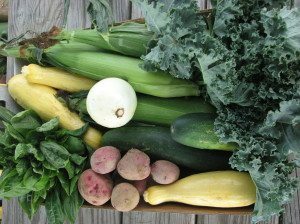 Our half share usually contain 5-6 types of vegetables each week, enough for the average family, & is a GREAT VALUE that provides great savings.